I had specially flown to Bombay to spend the day with Urdu poet Janab Iftekhar Imam Siddiqui. I spent the day talking to him, listening to his kalaam and clicking a few photographs. Meeting his brothers Janab Noaman Siddiqui & Janab Hamid Iqbal Siddiqui, poet, and academician at Dinath building, in the office of Shair, the oldest, still in print Urdu literary magazine. I was happy with the day’s work and was on my way back to Powai when I got a call from Gaurav Vaz asking if I was in Mumbai on Sunday. He told me that he was in Mumbai to watch the play Mughal-e-Azam being performed as a dance drama. He suggested I go and watch it as well. I jumped at the opportunity and he graciously arranged for the passes. Thank you so much, Gaurav. While Mughal-e-Azam was originally written as a play, it was made into an epic historical film by K Asif. I grew up loving this epic movie. Even today, I watch it at least once a year – it is that kind of a movie. I know each of the scenes, each dialogue by heart. So while I was excited that it is being performed on stage and directed by none other than Feroz Abbas Khan Saheb, but I had my reservations. Staging a play based on an epic movie raises huge expectations. The standards were set too high by the movie. As I entered the theater and took my seat, I noticed Mr. M S Sathyu sitting right next to me. I felt nervous. The play began with a message from Lata Mangeshkar, She spoke about the movie. As the play started, I heard a collective sigh from the audience. From there on, it was spellbinding. Every major scene from the movie was there in front of us, being performed live on stage. The grandeur of the movie was replicated with finesse. The movable steps, Mughal era pillars (that were raised and lowered as per the scene demands), the intricate jaali work, screens, front and back CG projections coupled with excellent light design took me to the era of Salim and Anarkali, just as the movie did. In fact, the play in that sense was better than the movie because a movie has the luxury of shooting a scene with selective camera angles and close-ups, which a stage productions does not. It has to be achieved purely by set and light design and performances. Prithviraj Kapoor, Dilip Kumar and Madhubala in the movie also set the bar very high for acting. The actors, Nissar Khan as Akbar, Priyanka Barve as Anarkali, Sunil Kumar Paliwal as Salim, did a very good job on stage. What stood out was the actors’ perfect Urdu diction, and that pleased me very much. Songs play a paramount role in the movie, and what set the stage production apart and made it very enticing, was the flawless live singing by the characters. Priyanka Barve as Anarkali sang the difficult songs, originally sung by none other than Lata Mangeshkar, extremely well, and Ashima Mahajan as Bahar was equally good. The dances! Ah, the dances were mesmerizing, they breathed life into the scenes. The emotions of Anarkali was reflected in each step, each bhav of the collective troop of very talented dancers. I was told that the very best were auditioned and chosen from various kathak gharanas. Mayuri Upadhya’s choreography makes this production complete and a pure delight to watch being performed. As I was watching the play, I remember waiting with bated breath for the song “Jab pyar kiya to darna kya” apart from the song and dance being timeless in itself, it was the depiction of sheesh mahal in the movie that had made big news. My expectations were raised as the play progressed, and my heart raced as the scene drew closer. Salim is on one side of the stage, and on the other is Akbar and Jodhabai. Anarkali is in the middle with her troop of dancers. The stage is a replica of Sheesh Mahal as it must have been in the Mughal era. There are huge arches with intricate jali and mirror work, and more mirrors hang from the ceiling reflecting the moves of the dancers dressed in long flowing costumes. Anarkali looking stunning in her gorgeous white and red ensemble singing “pyar kiya koi chori nahi ki, chhup chhup aaheN bharna kya”. As the song progresses, the dancers gain momentum in graceful rhythmic steps they match the lyrics, and dancers emote every emotion that Anarkali is going through. At this point I was completely overwhelmed. The sounds of hundreds of ghunghroo, rising to a crescendo, the fast, continuous pirouettes transport me to the era of Salim and Anarkali. It was magical, to say the least. The other place where choreography wins is a scene where Anarkali gets her last wish of being “Hindustan Ki Malika.” Bahar is singing “Jab raat hai itni matwali to subah ka alam kya hoga” Anarkali gives Salim the drugged rose, and Salim is about to faint. The emotions of both Anarkali and Salim depicted through dance were outstanding. The meticulous attention to details in each scene, right from the start when the Sangtarash begins to narrate the story till the end when Anarkali pardons Akbar for her murder, is what makes this epic drama as timeless as the movie. Posted on October 25, 2016 October 6, 2017 Categories Chronicles, ReviewsTags Anarkali, drama, Mughal-e-azam, urdu drama1 Comment on Mughal-e-Azam the play. This was one vacation I was really looking forward to specially after the fiasco of plans to spend a weekend in Pench. 17 years of togetherness, friends and jungle – nothing beats the combination and we did have whale of a time. NH7 was a pleasure to drive and I averaged 60km and covered 180 km distance in 3 hours. That meant driving at 140km/hr for some distance but then the roads were clear and smooth and Innova lends itself wonderfully to highway driving. We were at the park in peak summer and the heat was unbearable (mid day temperature was about 44° C) and there was very little water available -so most of the wild action was at concentrated around the water holes. 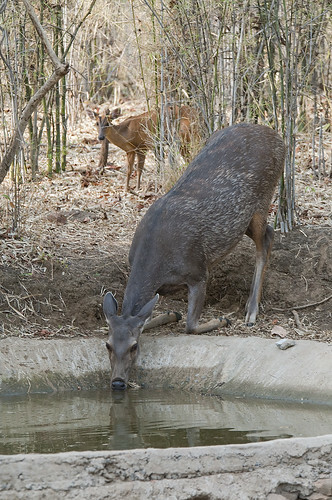 A tigress came to the water hole with four of her cubs to quench her thirst and cool herself down while down the same road another water saucer, made by the forest department saw a barking deer patiently waiting his turn to drink water while the bigger grazer, a Sambhar deer quenched his thirst. In smaller puddles birds frolicked in territorial displays and fought with each other while the butterflies that were mud puddling became meals of the fly catchers. We saw one handsome orange headed thrush in an extremely bad mood shooing another one of his own species till a white-browed fan-tail fly catcher got better of him and claimed the place as his own territory. Hierarchy : Barking deer waiting for his turn. 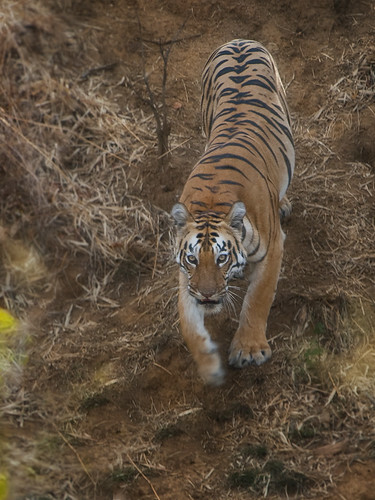 Not far away was another family of tigers, two adults, a male and a female with two cubs frolicking in mud and playing tag on the bund of a small water body. After many years Tarique and I attended Kalidas Festival this year and not just for our love of music. 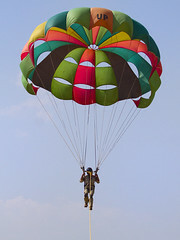 For the first time, Arayan Wachan (literally translates to watching the jungles) and Parasailing were organized as a part of the festival at Ramtek on 28th February (about 40kms from Nagpur) by Amol Khante of CAC Allrounder. Tarique and I couldn’t have been happier. Three things we love, music, adventure and jungles and an opportunity to explore them together all gave us the push we needed to drop all work on two weekends and become adrenalin junkies. 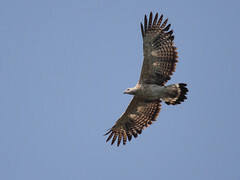 Bird Watching and Jungle watching was enjoyable in itself but what came as a huge bonus was discovering a Grey headed fish eagle at Mogarkasa. Perhaps a juvenile in search of a new territory (the GHFE was seen again at the same spot 2 weeks later). As if the high of spotting birds was not enough, we decided to push ourselves further and decided to parasail. And what fun it was. After almost 20 years both of us got a chance to go up in the sky and the thrill was unbeatable. Promising ourselves more of it, we returned home. Her effortless singing and mesmerizing voice sent shivers down my spine. I and Tarique held hands as she sang this romantic nazm by Gulzar. Set on Jazz; she took poetry to a level so high that only music could reach it. She made poetry look more beautiful than itself, her singing brought poetry to life, and her music and Gulzar saheb’s poetry became soul mates. I was lucky to meet Subhaji before the concert and so awestruck was I that I could not even tell her that I have been her fan for a long long time and have all her albums (all but one -“Ali more angana” It’s under litigation I learnt) But she was gracious and kind enough to sign two album covers for me. Subhaji’s awesome Koshish team included Dr. Aneesh Pradhan, Mr. Sudheer Nayak, Mr. Pratap Rath, and the Jazz musicians Mr. Joaquim Dias, Mr.Benoni Soans, Mr. Berry D’Silva and our own Nitin Joshi. It was lovely to meet Nitin after a long time. On 23rd May, 2010 I and Tarique were booked business class to fly from Nairobi to Mumbai. We took our boarding passes, and went to the lounge. The lounge itself was cramped and stuffy, but we endured. Around 4 PM we went out to check out the duty free shops and we heard boarding announcement for our 5.45 PM flight. We returned and found out that the announcement in the lounge was completely different. The receptionist told us that our flight KQ 202 to mumbai has been delayed by an hour. We relaxed, thinking there is still time for boarding. She said that the boarding announcement for business class passengers would be made around 6 PM and we can relax till then. After an 8 hour drive from Ngorongoro to Nairobi on terrible roads, we were really looking forward to a relaxed flight back home. At 5.45 PM the receptionist called me and Tarique and told us that we have been downgraded to economy class as two pilots have been allotted our seats. When we protested we were told to meet the duty manager at the boarding gate. The duty manager told us a different story. She said that yes, the pilots are there but we are not being downgraded because of the pilots but because the seats allotted to us were not serviceable and they did not know about it. I raised my voice and asked for a senior person from Kenya airways. While I was talking to the duty manger, Tarique heard the other person on the desk giving order to offload our baggage. All this, while Aasim who held a valid business class ticket was already boarded and was waiting for us. He frantically told the person not to offload the baggage and that our son is already in the craft. The duty manager coolly looks at us and says you only have one choice if you want to travel today – go economy class, there wont be any refund, and got us to sign some paper which according to her will allow us a free business class upgrade on our next KQ flight. All this was happening while the craft was already preparing to take off without us. Given a situation with no choice, we ensured that out baggage is loaded back and boarded the plane On our way we found out that all the seats of the business class were fully functional and occupied. The duty manager had lied to us about them being not serviceable. Feeling cheated we proceeded to our seats. An hour after take off, dinner was being served. When the hostess reached us, I asked for a chicken meal, only to be told that it is finished and if I need to eat I will have to make do with rice. The hot meal had nothing else but rice served along side a croissant and some salad. Needless to say it was totally inedible, but eat I did as my sugar levels were going low and I needed to eat something before I got completely hypoglycemic. Asking for water after I finished eating was another nasty experience. The hostess told me that she was occupied with serving coffee and water will come when it will. I saw her 2 minutes later standing on the aisle talking to another hostess. She stayed there laughing and talking for 10 minutes before I got off my seat went to her and asked for water again to which she pointed towards the serving area and said very rudely “go take it from there”. Kenya Airways treats it’s passengers very shabbily. Makes our own Indian Airlines/Air India look much better in front of them. Unfortunately for traveling non stop to Nairobi from Mumbai there is no option but this horrid airline. I am already dreading my next flight with them. Every serious reader I have ever met has read at least one of Ayn Rand’s best selling novels “Fountainhead” and “Atlas Shrugged” and most of the people I met have had strong opinions about her and her philosophy. I was 20 when I read “Fountainhead” and the words of Ayn Rand molded my thoughts and my philosophy; Rand became the person who gave me a direction to the way I would lead my life. Once discovered, reading her never satiated my thirst, I kept wanting more and went on to read almost all her published works. There still are times when I open “Virtue of Selfishness” and find a way to sort my confused thoughts. So when Tarique ordered “Goddess of the market” by Jennifer Burns, I was more than keen to read it. Not only it would give me more insights about my favourite books, but also give me a peek in the life of one of the most influential writers in the world : Ayn Rand. I must say here that I did disagree with her on some notions, but it was the premise of Rand’s philosophy that made her emerge a hero. Hypnotizing Maria and the rest of the world. Perhaps some people will not understand it as much as some others and then there would be some who won’t get a word, but we do hope to find some with clean slates who do. We are all teachers and students alike. What Donald Shimoda was to Richard, Jamie Forbes realizes, he is to Maria and his other advance flying students. More than 20 years back Illusions molded our mind that thinks the way it does today. Messiah? Hypnotist? What difference does it make? We are all we think ourselves to be. Continue reading Hypnotizing Maria and the rest of the world. Posted on March 2, 2010 Categories Inspirations, ReviewsTags birthday, richard bach2 Comments on Hypnotizing Maria and the rest of the world. I should actually write Rafcalfs as Charlie would say!! What would be recipe for a “good cinema”. Something that entertains yet makes you think, keeps you on the edge of your seat and yet relaxes you. End result – you come out of the theater humming “Dhan ta nan’ na na na na. A friend remarked that he found Kaminey to be very violent – my take is, we live in violent times. However, I prefer the violence shown in Kaminey to the dark, and extremely depressing torture shown in a film like NewYork (and even in the movie Khuda ke liye). The violence in Kaminey is a mockery whereas the ones shown in Newyork and Khuda ke liye a reality. Review: Barah Anna – Worth every Anna. Monday evening on my way back from the opthal, on an impulse we were browsing music when we came across the DVD of “Barah Aana” – Naseeruddin Shah as one of the lead actors definitely helped our decision to pick it up. We settled to watch the movie post dinner and quiet liked the turns the movie takes. That it had no songs was a big plus. Naseeruddin Shah as usual was superb but so were the other two actors, Arjun Mathur and Vijay Raaz. Small plot, fast pace, a 97 minute movie – works well for a working day evening watch. Continue reading Review: Barah Anna – Worth every Anna. Posted on July 22, 2009 July 22, 2009 Categories ReviewsTags movie, naseeruddinshah, reviewLeave a comment on Review: Barah Anna – Worth every Anna. The movie is not really racy, but its a light flick -so it serves the purpose. Subject of the move is bold/controversial/taboo which speaks for the A certificate from censor board..
Vinay Pathak as Pinu, the protagonist has done some good work – but then he is a fine actor and nothing less can be expected of him. Gul Panag looks ravishing, the dimples on her cheeks particularly cute, has done a great job of her somewhat limited role. She has lovely husky voice that sounds very sincere as she delivers her dialogues. I am perhaps one of the last of “my era” reading Asimov’s Foundation series. Finished reading Second foundation yesterday and some very obvious errors in his writing caught my eyes. While the use of words earth and unearthly can be attributed to the language per se (though I feel usage of term ground in first two instances and an adjective like eeire, ghostly or nightmarish would suit better). The usage of word dollars in chapter 18 however is totally incorrect as the foundationers used foundation credits as currency and not dollars. Disclaimer: These nitpicks are for the purpose of academic interest only. I am totally in love with Issac Asimov’s Foundation series books. Khuda ke liye – I finally purchased this DVD and saw it yesterday night. The director Shoaib Mansoor has been extremely succesful in presenting a subject that is as close to reality as it gets . So much so that at places it is outright scary!! In recent past, there hasn´t been a movie that has affected me as much as this one. Every film site has reviewed this movie but none of reviews do justice to the movie so I will refrain from writing another one. This movie is beyond it. All I can say is, watch this one!! So it has happened, I am on anti lipid drugs. After 5 years of fighting to keep my triglyceride levels in check with diet and exercises alone, my endocrinologist told me they are going over the roof now and I should be put on medication. During the annual health check up in March 06, the levels were 229 (normal is 200), a repeat lipid profile on 15th June 2006 shows that triglyceride level have happily glided up to 568 and VLDL from 46 to 113 -enough for the alarm bells to ring. I don’t like to live on medicines, but there is no escaping reality. I am glad though that I don’t have diabetes currently. Sunday was spent lazing around watching “Antarmahal” a Bengali movie directed by Rituparna Ghosh. To repeat myself, I love the way this man handles characters and their relationship. Playing with the light and dark shades of people he makes them all so real that it gives goose pimples. Bongs indeed are sensitive and creative people. Durga Puja, the most important festival of Bengali’s is the worship of ‘Shakti’ or the divine power and Maa Shakti’s four children, Ganesh, Kartikeya, Laxmi and Saraswati. Its an Utsab, festival season, a time to celebrate when families come together to worship, eat, laugh and enjoy the togetherness. This also happens in the movie Utsab, a tale beautifully woven by Rituparno Ghosh. A director I have come to admire so much, I want to see all his movies. The matriarch has four children, the eldest, Asit, trying to solve everyones problem is much like lord Ganesha, The second son, Nishit has work related problems that he wants to keep secret, but his wife knows -how she knows it, even he does not know The eldest daughter ,Parul, is married to a rich family, it was an arranged marriage against her wishes, for, she loved her poor cousin (Shishir – he too is a rich builder now ) her past haunts her, her husband taunts her and she thinks her grown up son, who is kind of repeating the history by being attracted to Asit’s beautiful daughter, is unaware of her turbulent past. The youngest daughter, Keya, an artist by heart, loves music, married against the families wishes, to a painter and a passionate politician who unfortunately lost out in the politics game and took to drinking. They have immense love simmering for each other which the viewer sees but somehow they fail to – entangled into the web of petty quarrel, they even talk of separation and perhaps seriously so. The play of emotions of each of these family members, who become your family members as you sit and watch the movie strike many familiar cords. Suppressed emotions hide in shadows and happy ones play with bursts of light. There is always a talk of rain clouds, it even rains, but one does not see it -just feel its aftereffects. Amidst all this is celebrated a festival. The festival of togetherness, the festival of family bonding, the festival of lights, festival of joy and festival of victory of good over evil -Durga Pooja and Vijayadashmi. While you sit and watch the movie it unfolds like a family reunion, just like the video Joy, Parul’s son shoots. The movie is in Bengali with english subtitles. Knowledge of elementary bengali helped, but I wish I could understand the finer nuances of the rich language to completely understand it -specially the beautiful song which Shompa, Asit’s daughter sings. One thing I had decided even before I reached Bangalore for Linux-Bangalore/2004 – that I will manage atleast one dinner at Shiok. So, three of us, that is I, and Aasim accompanied by and reached Shiok on 2nd December. We sat in the lounge, had a round of drinks -Tarique, Mona and Khader relished their cocktails while I and aasim sipped our non alcoholic drinks. The food we ate was out of the world and this is what we had and each dish is better than the other. One thing I am sure, no trip to Bangalore will be complete for us without visiting Shiok atleast once. Garlic-peppered prawns: Juicy, succulent prawns marinated in a wonderful mix of garlic and white pepper, deep-fried. Crispy chicken in ginger-garlic sauce: Chicken chunks, crispy outside, soft inside are served with a mild, flavourful sauce of ginger, garlic, soy sauce and sesame oil. Sichuan potsticker dumplings: Boiled, steamed, or fried? How about all three in the same dish? These “potstickers” dumplings are first pan-fried, then cooked in hot stock. They then get a crispy base and a tender top. Pop them into your mouth in one shot and enjoy the taste explosion. Golden baskets: Finely chopped chicken and soft sweet corn are stir-fried with a fragrant mixture of garlic, coriander roots, white pepper and soy sauce. Served in golden-crisp rice flour baskets. Perfect finger food. Crispy fish in red curry sauce: First we take a whole fish, season it, and fry it. Then we smother it in our special red curry sauce. The fish remains crispy and the sauce plays with it nicely. Nonya chicken: A classic example of mixed cuisine, the very Malay chilli is combined with the very Chinese dark soy sauce, star anise, and spring onions, and braised in this aromatic mixture. The resulting dish is surprisingly mild with just a hint of chilli. Orange-lemon chicken: If you think only spicy dishes are tasty, you have to try our orange-lemon chicken. It’s different from the gooey lemon chicken found elsewhere and it’s yummy. That’s all we’re saying. Singapore rice noodles :While no such dish exists in Singapore, this is the closest we know to what passes for it. Thin rice stick noodles are cooked with chicken, garlic, a touch of chillies and soy sauce. Nasi goreng : Literally meaning “fried rice”, this Indonesian everyday dish is usually made by combining leftover rice with leftover anything else. We make it by frying a spice paste first, adding meat, rice, and sweet soy sauce, garnished with a fried egg. While I loved every dish, my fav (and the taste still lingers when i think of it) remains Orange lemon chicken. While we were just finishing, Madhu gave us a taste of his famous cocktail – Illusions – absolutely lovely and yes, I am sure it hits without warning -its smooth! Posted on December 10, 2004 July 9, 2009 Categories Reviews3 Comments on Shiok!! It was absolutely divine listening to this 76 year old lady sing and make audience crave for more. “I am learning for the past seventy years, I can sing at least for 70 hours” (sattar saal ka riaz hai, sattar ghante to ga hi sakti hoon) she replies to the shouts of “aur sunaiye” “aur sunaiye” from audience. Ably accompanied by Anuradha pal, the lady tabla player who accompanied Ustad Shahid Parvez, Gaan-tapswini Girija Devi ji started the concert with Rag Jog, going into aalap’s that floored the audience. In between the performance she shared her knowledge and belief’s with the audience – Laya maya hai jo har kalakar ko uksati hai aur main bhee is se baach nahi paati hoon, main bhee taan leti hoon aur tab main solah saal ki bacchi ban jaati hoon“. She enthralled the audience by rendition of tappa ”miyan nazar nahi aanda way“ followed by a thumri set in mishra Desh ”more saiyan bulawe aadhi raat. Girija Devi has spent many years in researching Thumri and it shows every time she performs one. Coupled with good lyrics Thumari sounds more interesting and it is like a dream come true when swar gets suitable words she told the eager audience. Earlier back stage, when i took her photo, she said, ”kheench rahi ho to bhejna zaroor“ and she autographed on one of her CDs which I was carrying. One of her deciples gave me her calcutta address to which I am sending the prints of the concert photographs. Proudly powered by WordPress Theme: twentyfifteen-swati.